As a dive instructor, I receive countless questions from my students. Over time, the same types of questions seem to reoccur. One of the most common recurring questions I get as a female instructor, relates to “that special time of the month”. Is it ok to go scuba diving on my period? The simple answer to this question is yes, it is perfectly safe to dive on your period. Diving whilst menstruating should not be any cause for concern, provided that normal exercise does not increase your menstrual symptoms. So, simply go about it in your normal way, such as if you were going for a swim. If you are at all concerned about your personal circumstances, do ensure you consult with your GP prior to making your mind up. Will sharks attack me if I dive on my period? So that’s the simple answer to the simple question. However, I often find that the simple question masks the real question. What the real question should be is “will I get attacked by sharks if I dive when I’m menstruating?”. The answer to the real question is no! For starters, the chances of being attacked by a shark in any case is so minuscule that you should assume it is nil. From the small amount of shark attack data in existence, there is simply nothing to support the fact that menstruation increases your chances of being attacked. Contrary to popular misconception, sharks are just not that interested in human blood. Studies have been conducted to show that sharks appear curious, but not aggressive when human blood is in the water. In fact, sharks are more attracted to fish gastric juices, rather than fish blood, such as a fish that has been attacked, is dying or injured and leaking gastric juices. In any case, the amount of blood loss due to menstruation is very small, only a few millimetres of blood a day, with the majority of fluid loss being water and uterine lining cells. Furthermore, most females will find that their period actually stops during their dive; the vaginal opening stays closed and the increase in ambient pressure would stop any potential fluids from leaking. 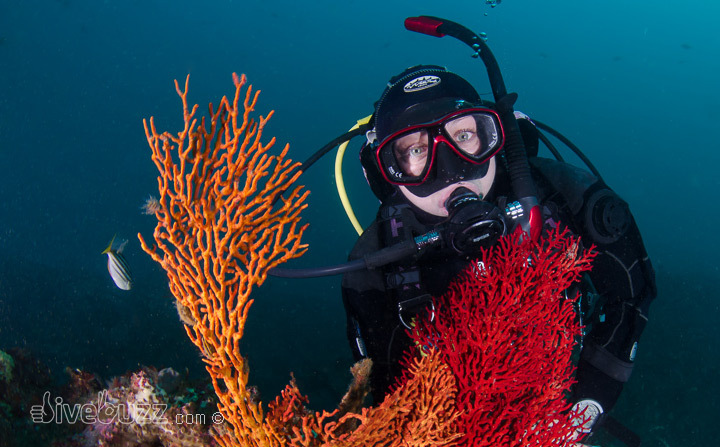 As a dive professional, I dived every day of the month throughout the year, and you will find that most other female divers also dive continually, whether during their periods or not. Some studies suggest that scuba diving while menstruating may increase a diver’s chance of decompression sickness, but I suspect this may be more to do with fluid loss and dehydration, so I’d advise to dive conservatively and always stay fully hydrated when diving on your period. But, whether on your period or not, I’d always say you should dive conservatively and stay fully hydrated when diving! Finally, some evidence does suggest that surfers who periodically urinate in their wetsuits may have a higher chance of shark attack than those who do not, although the odds are still statistically minuscule. So, the bottom line is, you are more likely to be attacked from urinating in your wetsuit, whether male or female, than you are from menstruating! So there you have it. There’s no excuse to stay dry during your time of the month! Diving Sydney - It's a shore thing! While working as an underwater photographer specializing in sharks we had a new female staff photographer on her first day was terrified the sharks were going to smell blood in the water. No matter what any of the other crew could tell her it did not stop the tears. After the dive I have never seen anyone so happy to be wrong. Keep up the good articles. Thanks for your comments Alana, there is no reason to worry at all. Enjoy the sharks! I’m sure you will have a blast. Where are you going…? Thank you for the very informative article! I have only been diving a few years and was wondering about this…we’re headed to the Cayman Islands next month for a live-aboard and this crossed my mind. It’s nice to know that there’s no cause for extra concern!! Hi Amy, I’m glad I could put your mind at ease. And have a great time on your liveaboard in the Caymans. Happy diving! thank you for your information! I just started my diving lesson and tomorrow will be my 3rd time and just in time I got my 1st period! thank you so much! your article was very informative. i just got my period today and will do my 1st open water dive tomorrow. i was extremely reluctant and nervous about it, but now i am not so worried. you rock! Thanks for your comments Gem, nothing to worry about at all. And good luck with your OW course tomorrow – I hope it’s the first of many dives for you! Great article! Do you know about the menstrual cup? I’m using it and it’s very safe, comfortable and you don’t have to change it so frequently. I had practiced sports and swimming while using it, but not sure if it’s safe for scuba diving due to the pressure. Do you have any clue? I just got back from a dive trip and I used a menstrual cup. Didn’t have any sort of bad effect because of pressure equalisation or anything and I went to 43m. Not sure what happens when you go deeper though! I’m all about diving with a Diva Cup. They have a way bigger capacity than tampons do so you don’t have to worry about any accidents while you’re on the boat. Jackie @Diva Cups recently posted…What’s the Best Menstrual Cup? I really like to use a menstrual cup when diving. It’s perfect for those long days on a boat without a bathroom.